The Armstrong Tunnel was built 1926-27. It features twin bores of horseshoe cross-section with a 45 degree bend part of the way through. It also has a pedestrian walkway on the western side. It runs from Second Av at the South Tenth St Bridge, under the Bluff (Boyd's Hill) where Duquesne University is located, to Forbes Av between Boyd St and Washington Pl. One legend states that the bend in the tunnel was a mistake...and that the responsible party committed suicide in shame. Mr. Covell, of course, lived on to build again. Although they didn't have GPS or laser guided measuring systems in those days, it's doubtful they would have been off by that much without being aware of it. It probably had more to do with mines or other geological factors, property rights (including Duquesne University), alignments with existing or proposed roads (like the 10th St Bridge). The tunnel carefully threads its way between and below the university buildings...under parking lots and the athletic field...just barely skirting the corners of a couple buildings. Many of the buildings were constructed after the tunnel, but certainly the placement of each is related. In 1993 Duquesne University built a new athletic field along Bluff St above the tunnel. Arthur J. Rooney Field, named for the graduate who founded the Pittsburgh Steelers football team, was designed to fit into a confined area but was also limited by its location above the tunnels. By carefully excavating six feet, a terrace was created for concrete bleachers to the north and grassy hillside to the south on which temporary aluminum bleachers may be erected. There was also a Tunnel St (now Chatham St) which ran parallel to the northern section of Washington Pl and the eastern section of Sixth Av (therefore at an approximate 45 degree angle in relation to Forbes Av). The southern end of Tunnel St nearly aligns with the northern portals of the Armstrong Tunnels, but does not connect directly. This is all coincidence: Tunnel St was long ago named for the sealed-off, but still existing, Pennsylvania Canal tunnel which was cut through Grant's Hill about 1829. Where Tunnel St would have possibly met the Armstrong Tunnels, the block between Fifth Av and Forbes Av is filled by the former Fisher Scientific headquarters (now labeled as Fisher Hall of Duq Univ). A bridge has crossed the Monongahela River at South Tenth Street since c1861 when a wooden covered bridge was built. A metal through truss bridge replaced the wooden structure in 1904. One of Pittsburgh's inclines was located near the northern end of the bridge. The Fort Pitt incline began operation in 1882. A city-owned concrete stairway traces the approximate path of the incline between the Blvd of the Allies (Bluff St) and Second Av. Some remnants of stone foundations may be seen there. When Pittsburgh annexed the town of Birmingham (South Side), there were calls for better access to the south shore of the Mon. Most of the traffic had relied on crossings at Smithfield St. And further upstream, the Brady St Bridge was built at South 22nd St in 1896. Between these two crossings, the proposal to open a passage under Boyd's Hill was seen as a way to relieve traffic in the upper Triangle and increase access to the South Side. With the increase of traffic brought by the Armstrong Tunnels and the condition of the 1904 truss bridge at South Tenth St, Pittsburgh's only conventional suspension river bridge was built in 1931. At 750 ft, it is the longest span on the Monongahela River. Although the Liberty Tunnels had been completed previously (1919-1924) with concrete portals, the Armstrong Tunnels were given Italian Renaissance stone walls and cut-stone portals -- the end of an era and the beginning of modern construction materials. Both were built by the same contractor. The predominant material visible is sandstone blocks which cover the concrete structure. The portals are trimmed with granite. The tunnel vault is concrete. There are signs of a 1980s renovation: the interior walls below the arch spring line have been faced with white ceramic tiles similar to those used in the Fort Pitt and Squirrel Hill tunnels. The sidewalk is protected by a Jersey barrier and the road surface is concrete. The tunnel portals were designed by City architect Stanley L. Roush who was also noted for the Smithfield St Bridge portals, the City-County Building, the Corliss Tunnel, the lowering of the Courthouse entrance and many other City projects. Vernon R. Covell of the Allegheny County Public Works Department was the chief engineer. His name is found on many bridges of that time. Booth & Flinn were also the contractors for the 1924 Liberty Tunnels and the 1904 Mount Washington Transit Tunnel among many other public works projects. 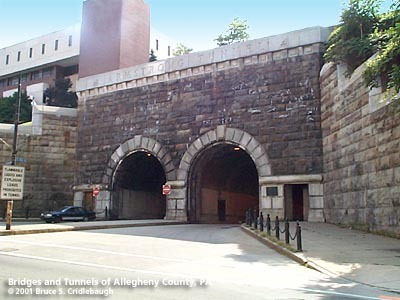 The tunnels were named in honor of Joseph G. Armstrong, who had served as Director of Public Works at a most active time in Allegheny County. Most of the bridges over the three rivers were replaced between 1910 and 1940, which included Mr. Armstrong's terms as Mayor of Pittsburgh and Allegheny County Commissioner. He is listed as the chairman of the Allegheny County Commissioners at the time of construction. Between 1956 and 1958, the Penn Lincoln Parkway was built over the now-removed Baltimore and Ohio passenger terminal tracks. The elevated section of the westbound lanes and the Second Av ramp were constructed directly in front of the southern portal of the Armstrong Tunnels. The stone portals are now mostly obscured by the ramps, but the top of the cornice with the name of the tunnels may be seen from the highway.